Most of the world is getting used to the fact that China is now a major player on the economic stage - it has witnessed the most rapid industrialisation in history - but is this phenomenal rate of change sustainable? The Organisation for Economic Cooperation and Development seems to think so. The OECD's first report on the Chinese economy says China has recorded annual growth of 9.5% every year for the past 20 years. And that growth will continue, for some time to come. The economies of Britain, France and Italy could all be leapfrogged by China in the next five years. At the same time, China could overtake the US and Germany to become the world's largest exporter. 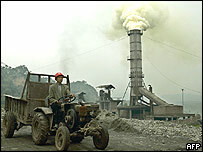 This rapid transformation was brought about by the 25-year liberalisation process managed by the Communist Party. The state may have set the ball rolling, but it is the private sector - China's millions of entrepreneurs - that has built this economic miracle. The OECD notes that more than half the national income is generated privately now, and it is the private sector that is creating the majority of the new jobs in China. But state owned enterprises have not disappeared, and some are not doing too badly - their rate of return increased from 5% to 10% in the five years to 2003. But others are faring far worse. The OECD estimates that over a third of all state-owned companies are not making a positive rate of return. The government has to work harder at closing down these loss making businesses, says the report. And it is about time China had a look at its taxation policy. The top rate of tax is 45%, although few earn enough to qualify - yet. The OECD would like to see the rate lowered, and the threshold for taxes raised higher. This will increase economic growth, and encourage more Chinese to fill-out their tax returns. 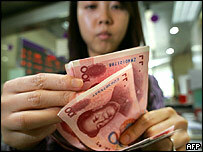 It is also time for the Chinese currency - the yuan - to become more flexible, says the report. Pegged to the US dollar until July of this year, it now follows a basket of currencies. Todd Lee, the China analyst with economic forecaster Global Insight, agrees. "The fixed exchange rate forces the real economy to take on shocks directly, as opposed to having a flexible exchange rate to partially absorb the impact," he says. Increased flexibility would improve the government's ability to steer the economy through the trickier parts of the business cycle. A key element of China's new-found economic freedom has been the introduction of property rights. But the OECD says they do not go far enough. Under current laws, residential owners are allowed a 70 year lease on property, commercial owners just 30 years. The rate of change is China is so astonishing that it is conceivable that it will gradually introduce many of the changes the OECD recommends. That would bring the country closer to the Paris-based organisation's 30 existing members. But one glaring difference remains between China and the rest of the world's richest economies - every one of the OECD's members is a democracy.